A daytime, parking-lot brawl between an opportunistic raccoon and a green iguana is just about as juicy as urban-animal showdowns get. This short clip, filmed by Boca Raton-resident Frankie Gentry in southeast Florida last month, shows a raccoon chasing down and tackling an iguana in the middle of a busy parking lot. After pinning its prey, the raccoon pauses for a moment to stare down Gentry before dragging the iguana between two parked cars, leaving nothing behind but the lizard's still-twitching tail as evidence of the incident. It's a startling display of urban-raccoon opportunism and it's perhaps unsurprising that the tarmac takedown took place in Florida. The Sunshine State is a reliable epicentre for unpredictable animal encounters, from gators in drainpipes to crocodiles in swimming pools. Florida's sticky, coastal climate and abundance of water (particularly in the southerly Everglades) make it an ideal habitat for a number of species like alligators and bald eagles. It’s also home to growing populations of nonnative animals including Burmese pythons, Cuban tree frogs and giant African snails that have established here in large numbers. Green iguanas are also immigrants to the Everglades and are amongst the most problematic of the state's invasive alien species. They hail from Central America and were first brought to Florida in the 1960s as pets prized for their vibrant colours. The reptiles are now thriving in south Florida where they are pushing out native species, damaging landscape vegetation, and generally causing a nuisance for Florida homeowners. According to Frank Mazzotti, a wildlife ecology professor at the University of Florida, humans have inadvertently helped the surge of green iguana numbers by creating manicured gardens filled with plants, like hibiscus, on which the reptiles thrive. Iguanas have also taken to colonising the state's tree-lined water canals, making it easier for them to infiltrate Floridian suburbia. Green iguanas are thriving in the sticky heat of Florida's Everglades. This year's summer brought with it the biggest surge in iguana numbers to date, and removal efforts are under way, says Mazzotti. For Thomas Portuallo, owner of a Fort Lauderdale-based company called Iguana Control, it's been a bumper season: “This year is the most iguanas I’ve seen and I’ve been in business for nine years,” he told The Sun-Sentinel. Iguana numbers can fluctuate significantly, however, and a particularly severe cold snap could dramatically reduce the population. "Iguanas are not cold tolerant, so they probably are pretty well limited in range to where they are found now," Richard Engeman, a biologist for the National Wildlife Research Centre, told us via email. Florida's raccoons will be hoping that the weather stays warm, as more iguanas could mean fuller bellies for the bandit-masked 'trash pandas'. "Raccoons are omnivorous predators so will eat anything they can find," explains Dr Suzanne MacDonald, a psychologist and biologist at Toronto's York University who has studied Canada's raccoons. "That iguana was pretty big but raccoons take on rats as well, so you can never underestimate their ability to take down something almost as big as they are." MacDonald also points out that Florida's raccoons seem to be more active during the day compared to their northern cousins, which may help explain why this bold iguana-muncher was out in broad daylight. While raccoons have probably been snacking on green iguanas for as long as the two species have been thriving in the Everglades, the first documented predation was outlined in a research paper in 2006. The victim was a juvenile iguana in Fort Lauderdale's Hugh Taylor Birch State Park (HTBSP) – an area that, in the early 2000s, had the third highest raccoon density ever reported in North America. Authorities began trapping and removing raccoons out of concern that the sizeable population may spread disease or become a traffic hazard. 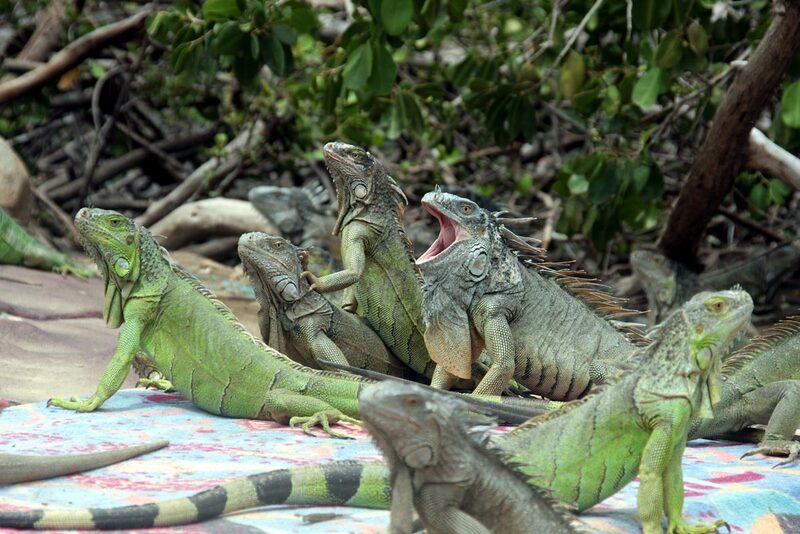 What they probably weren't expecting was a huge increase in iguana numbers following the raccoon removal. "High numbers of the Green Iguana at HTBSP within a few years of Raccoon removal were suspected to be a direct result of sudden release from intense predation," the study authors wrote in the paper. It seems then that Florida's raccoons, alongside other predators like alligators and birds of prey, could play a vital role in keeping green iguana numbers in check. As officials continue to work on eradicating the invasive reptiles, it looks like the state's raccoons are already doing their bit. Courtside iguanas just can't get any peace.